The Gilbert & Sullivan Society of Chester County, a non-profit and collaborative town-gown Venture of the School of Music West Chester University, was founded in 1987 and is known for it~ excellence in professional stage and community productions. Participating in two stateside International G&S Festivals, the Society received recognition for the excellence of their Trial in 1996. The Society consists of townspeople, faculty, and students oi Chester County and the surrounding areas and its next production will be Pirates on November 5-8, 1998.
raise money for new church buildings, a group of Sudbury United Methodist Church members decided to put on Trial, which marked the group's beginnings. lt grew along with its reputation and for Mikado in 1969 the venue was shifted to the Lincoln-Sudbury Regional High School. The Sudbury Savoyards remains affiliated with the Sudbury United Methodist Church and all income over expenses from its shows is earmarked for world hunger relief. Last year it donated over $6,000 to this cause through donations managed by the Methodist Committee for Relief. Starting in 1963 with Pirates, The Durham Savoyards have performed each G&S opera at least twice (except for the singular Grand Duke). Annual spring performances in Durham and Wilmington, NC highlight the year-round camaraderie of the group. We celebrate our 35th Anniversary on November 22nd with a performance of Places Please!, A Savoyard Symphony, by music director Benjamin Keaton. Come see our fifth production of Pirates in Spring 1999. The Washington Savoyards, Ltd, have been performing since 1973 and each year produces two operas from the G&S repertoire. ln 1981 the company changed its name from the Montgomery (County) Savoyards to reflect its service to the entire National Capital Area. Presented at the Sing-Out will be its most recent (May 1998) production of Gondoliers. Its upcoming season will include Mikado in November 1998, and Sorcerer in May 1999. In addition, in 1999 the Savoyards will have its third annual gala presentation at the British Embassy. Details regarding the September 10 and 11 auditions for Mikado and Sorcerer can be found in The Washington Post Guide to the Lively Arts. The Victorian Lyric Opera Company was founded in 1978 and is primarily devoted to producing works of W .S. 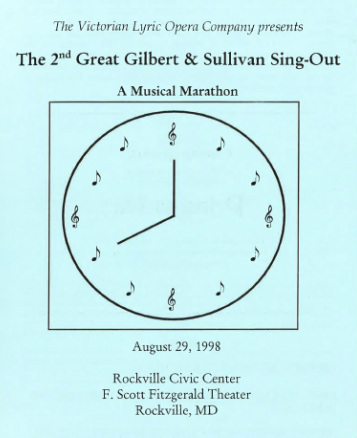 Gilbert and Sir Arthur Sullivan, collectively or individually. VLOC presents two productions annually and remains faithful to a traditional, but lively, approach to the operettas. Based in Rockville, it draws performers and audience members from throughout the metropolitan Washington area. Upcoming VLOC productions include Princess Ida (February 1999) and HMS Pinafore (June 1999). Les Elkins, Kerry Freese, Mitch Gillett, Kim Haug (Rockville Civic Center), Lyle & Donna Jaffe, Kate Lawniczak, Julia Lukas Gorman, Steven Mager, Steve Mueller of Occasions Catering, Samuel Silvers, Mollie Toms , and the members of the Sing-Out Organizing Committee.